The interior of the Holland America Line Koningsdam cruise ship is contemporary and classic. The ship has a musical theme, with many of the cabin decks named for famous musicians. 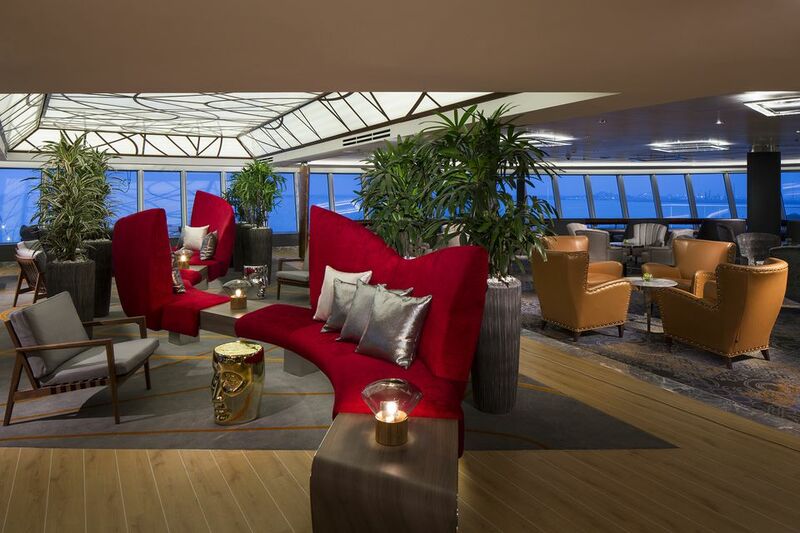 As might be expected, the Crow's Nest lounge on the Koningsdam is located forward on deck 12, the highest venue on the ship. With its wrap-around windows, it's a perfect place to sit either in the daytime or in the evening. This photo tour of the interiors of the Koningsdam includes a look at the lounges and bars, entertainment venues, casino, spa and fitness center, and other interior common areas of the cruise ship. The Notes Whiskey Bar is located in the Music Walk entertainment area of the Holland America Line Kongingsdam cruise ship. This whiskey bar offers shots of dozens of different types of whiskey. When I asked the bartender which bottle was the most expensive, he pointed to a bottle of Royal Lochnagar single malt Scotch whiskey. I saw a price tag of $299 on the bottle, and he quickly explained that was for a shot, not the whole bottle! Nice story to take home from a cruise--trying a shot for $299. Alas, I cannot tell a lie. I didn't try it. The Explorer's Bar on the Holland America Line Kongingsdam cruise ship is located inside the Lincoln Center Stage section of Music Walk on deck 3. This bar is popular before, after, or during performances at the Lincoln Center Stage or Billboard Onboard entertainment areas. Sometimes guests on the Holland America Line Kongingsdam cruise ship just want to sit at the bar and watch the action (and people) on the ship or have a drink with old or new friends. Since the casino is open late, it's always a busy place in the evening after the shows. Like Billboard Onboard, Lincoln Center Stage is also found in the deck 3 Music Walk area of the Holland America Koningsdam cruise ship. As the name suggests, Holland America Line has partnered with the iconic Lincoln Center to secure high-quality classical musicians to play on the cruise ship. These outstanding musicians perform chamber music each evening on the Lincoln Center Stage and have afternoon recitals on sea days. The Queen's Lounge is the third musical venue on the Koningsdam's Music Walk, joining Billboard Onboard and Lincoln Center Stage. On the ship, it's more likely to be called, "B.B. King's" since a group representing the B.B. King's Blues Club from Memphis performs nightly at the Queen's Lounge. Since the venue has a large dance floor, it's a great place to find dance music during and after the B.B. King's show. The Queen's Lounge has seating for 330 guests, spread across decks 2 and 3. The 667-seat World Stage on the Holland America Line Koningsdam cruise ship is on decks 2 and 3 forward. This photo was taken during the day when the venue did not have any performances, the next page shows the World Stage video screen in use. This theater is spectacular, with great seating throughout and shows that incorporate the 250-foot-long, two-deck-high LED video screen. Special performances have been designed for the onboard troupe that utilizes the screen effectively, showing scenes from around the world. In addition, guest performers also incorporate the screen into their shows. I thoroughly enjoyed all the shows we saw on the World Stage. Since the venue is relatively small, the Koningsdam has three performances of the show nightly rather than two. The World Stage certainly seems to come alive when the video screen is lit up. It might look drab in the previous photo, but not in this one. The casino on the Koningsdam has all the standard games, plus lots of slot machines. The casino is located on deck 3 but has its own staircase linking it to the Music Walk venues below on deck 2. The Greenhouse Spa & Salon is on deck 9 forward. This lovely spa has all the standard ​spa and salon treatments like massages, facials, and hair styling. Many of the treatment rooms face the sea, so guests can have a massage, and be mesmerized by the sea at the same time. In addition, the spa has thermal pools and heated ceramic lounges. This thermal pool is a popular area at the Greenhouse Spa on the Koningsdam. The fitness center on the Koningsdam is located inside the spa. It is equipped with the latest cardio and weight machines and features fitness classes in yoga, Pilates, stretching, and more. Many Holland America guests are into life-long learning, and most of us can always learn something new on the computer. The Digital Workshop on the Koningsdam has classes on many Windows-based products. These tips and techniques are very useful to all of us who live in a digital world. The Atrium on the Holland America Line Koningsdam is the hub of the cruise ship. It is surrounded by restaurants, bars, guest services, and retail shops. It's a busy place!